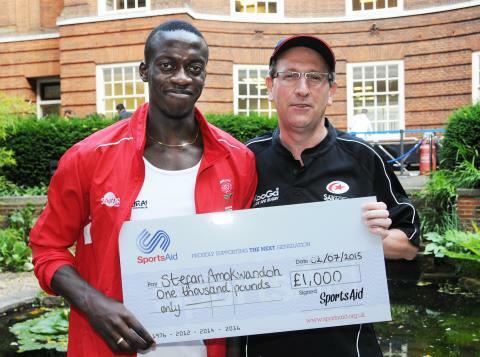 Triple jumper Stefan Amokwandoh, 18 from Selsdon, receives a £1,000 SportsAid award from Rayner Essex partner Tim Sansom. Photo by www.andywrightphotographer.com at SportsAid's Bloomsbury BBQ fundraiser, organised by Rayner Essex at BMA House on Thursday, 2 July 2015. Prior to publication, it must be approved by SportsAid. Stefan Amokwando from Croydon and Lola Anderson from Twickenham got to meet Rugby World Cup winners Maggie Alfonsi and Natasha Hunt last night after receiving cheques for £1000 to help them achieve their Olympic ambitions.